Matthew Osborne and Mathew Sim. Are central bank reserves still ‘special’? Historically, reserves have been “special” for several reasons: they are the ultimate means of settling payments between banks; they are the main medium through which central banks make monetary policy decisions “happen”; and crucially, central banks have a monopoly supply. Some of this specialness has now reduced, at least in the traditional sense. But, as this blog post goes on to explain, new liquidity standards suggest a new and important role for central bank reserves, which will create challenges as monetary policy is normalised. Finally, control over supply of reserves could also be a useful macroprudential policy tool. In a definitional sense, central bank reserves are a form of money held in accounts with the central bank. Traditionally reserves have been held by banks, though access has recently been widened by the Bank of England to allow CCPs and broker-dealers to apply for reserve accounts. Reserves can only be created by the central bank and hence are considered to be “narrow money”, alongside cash, in contrast to broader forms of money such as bank deposits which may be created elsewhere in the financial system. For commercial banks, the specialness of reserves comes from their role as a medium for payments between reserves account holders. Payments may result from a bank’s own activities, such as lending reserves to other banks, or they might result from transactions made between firms or individuals, which are settled across their banks’ reserves accounts. For example, if an individual buys a house, the payment is transferred from his bank to the seller’s bank and this will be settled across their banks’ reserves accounts. Since the net impact of many such payment flows is unpredictable, banks usually wish to hold reserves as a precautionary buffer to ensure they are always able to meet their obligations. For central banks, reserves are key to their control of short-term interest rates. A popular method, used by many central banks in the past, is to set monetary policy by regulating the supply of reserves. Short-term interest rates are set by supplying reserves through open market operations (OMOs) at the desired policy rate. Under this approach, central banks need not necessarily pay interest on reserves. The corresponding demand for reserves may derive from their settlement or liquidity value. Or it could be pinned down more formally by imposing reserves requirements, which require banks to maintain a minimum level of reserves or face a penalty. Why might reserves be becoming less special? There are reasons to suggest that reserves have become less special over the recent past. For commercial banks, the role of reserves in settling payments is an important driver of demand for reserves, particularly where banks are not required to hold reserves, and the central bank does not pay interest on them. But for the most part, the only reserves needed by banks is the amount required as an end-of-day buffer against unexpected payment shocks – during the day, the largest banks can obtain intraday liquidity using other assets as collateral. This end-of-day buffer is typically small and has reduced as technology has made management of payment flows more precise, while greater CHAPS access has widened access to intraday liquidity. Reserves remuneration has further changed the role of reserves. On one hand, it has boosted demand from commercial banks as remuneration reduces the opportunity cost of holding them. As the chart below shows, when reserves began to be remunerated at the policy rate (Bank Rate) in the UK under the reserves averaging framework adopted in 2006, the stock of reserves supplied quickly rose to around £20-25 billion, from around £100mn. But remuneration of reserves erodes much of their “specialness” as, in an economic sense, they become similar to short-term government liabilities (which may be sold or used as collateral to borrow cash when required). As such, they become much more like part of the broader spectrum of liquid assets, assessed against their liquidity value and expected return. 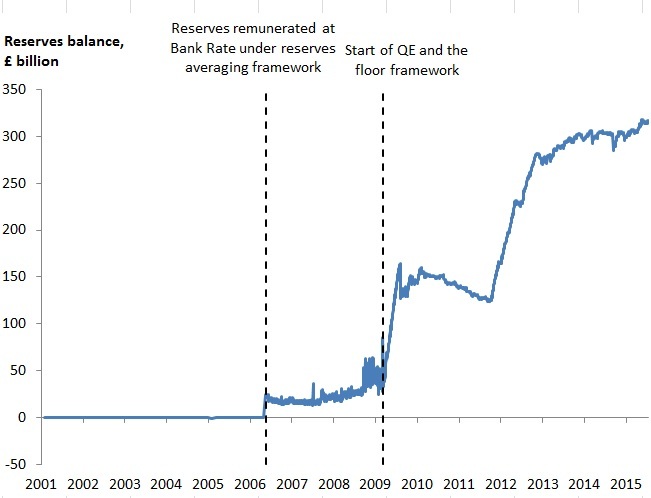 Reserves have also become less important in the narrow sense of control over interest rates. Central banks increasingly guide market rates via the rate at which they remunerate reserves, rather than the level of reserves. Much recent thinking (for example, Keister, Martin and McAndrews, 2008) about reserves focuses on whether central banks may be able to separate the quantity of reserves supplied from monetary policy, preserving the central bank’s control over interest rates irrespective of demand for base money for settlement or liquidity purposes. In practice, such thinking has been echoed during the crisis as banks have adapted their operating frameworks to cope with the large increase in reserves necessitated by quantitative easing. Reserves remuneration ensures that banks have no incentive to lend at a rate below the policy rate, despite the high level of excess reserves (which, in turn, places an implicit ceiling on rates). Hence, a floor enables the central bank to shift market rates, without reference to the quantity of reserves, by changing the remuneration rate. Reserves have become less special in their traditional sense. But their role has expanded in other ways. Formal liquidity regulation has increased the structural demand for reserves. Reserves are at the very top of the spectrum in liquidity terms, as reserves are a highly reliable store of value – they are the only way in which interbank payments can ultimately be settled, and their value is not subject to market risk. Reserves are accordingly included in the highest tier of liquid assets required by regulators under the new internationally agreed Liquidity Coverage Ratio, and currently account for 35% of high quality liquid assets held by international banks. This role for reserves as a liquid asset, rather than purely as a means of settlement suggests that demand for reserves is likely to be both higher and more volatile in future and presents a challenge for central banks in managing reserves. Demand for reserves as a liquid asset is likely to fluctuate over time, since banks face an optimisation problem over the trade-off between the liquidity value of reserves and the higher yield offered by other liquid assets. The current low yield environment encourages banks’ voluntary demand for reserves, as low returns reduce the incentive to hold less liquid assets. This could change in future – for example, if term premia rise once QE policies are unwound. But new liquidity standards suggest that overall, demand for reserves will remain higher on average than pre-crisis. A further challenge is that as QE policies are unwound (i.e. assets are sold or proceeds of redemption are not re-invested), the supply of reserves will fall and, at some point, the level of reserves may fall below the level of banks’ voluntary demand. In this scenario, in order to avoid market rates rising above the policy rate, as commercial banks look to meet their demand for reserves, central banks will have to supply new reserves. This means that central banks will have to work out how to supply reserves, such as through further asset purchases (but this time not as part of a QE programme) or repo operations. Finally, the role of reserves in liquidity regulation means that reserves may be used as a macroprudential tool – particularly where, as in the BOE, monetary policy and macroprudential regulation are housed in the central bank. Reserves policy is not part of the toolset envisaged for the Financial Policy Committee (FPC). But it could be a potent tool for controlling the degree of maturity transformation carried out by the banking sector via the imposition of varying reserves requirements. Use of reserves in this way, it should be noted, is less novel among emerging market economies (e.g. Claessens highlights use of this tool by EMEs on several occasions since 2000). Reserves held to meet reserve requirements do not count towards the liquid asset buffer for calculation of the Liquidity Coverage Ratio (unless the central bank agrees that they can be drawn down in times of stress). Hence, raising a reserves requirement by £1 would mean that a bank would have to raise an additional £1 of liquid assets to maintain its liquid asset buffer, providing macroprudential authorities with a tool to increase the costs for banks of generating short-term liabilities in periods of over-exuberance (Kashyap and Stein 2012) make a similar proposal though they do not link it to the ineligibility of required reserves in the LCR). Central banks could also use the terms on which banks can obtain reserves in exchange for less liquid collateral (i.e. through rates, haircuts and asset eligibility) to influence liquidity conditions for macroprudential purposes. Reserves may have edged away from their traditional role in the recent past. But they retain their relevance, both as a part of banks’ strategies in meeting new liquidity regulation, and as a key plank of central banks’ financial stability responsibilities, both with respects to liquidity insurance, and potentially, macroprudential policy. Matthew Osborne works in the Bank’s Sterling Markets Division and Mathew Sim works in the Bank’s Monetary Assessment and Strategy Division. Next Post How important are households’ expectations for spending?